Larry (the younger of my two older brothers and a Mt. Whitney alumnus) proposed a Mt. 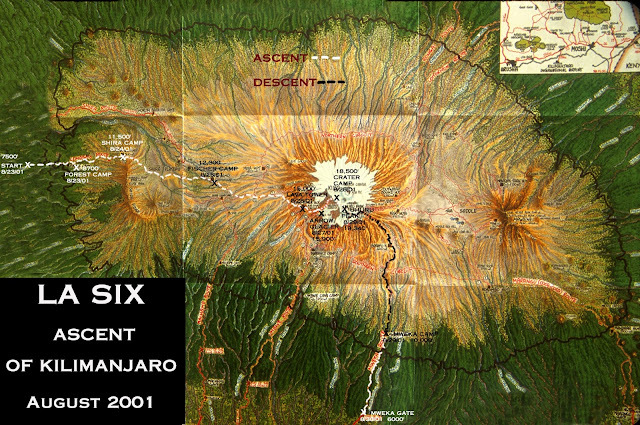 Kilimanjaro expedition to celebrate his 40th birthday in July 2001. I was immediately interested. My hiking buddy, Helene Rosenzweig (a dermatology specialist and a Mt. Whitney alumnus,) was also intrigued, but not fully prepared to commit. Right after watching the summer Olympics opening ceremony at Ricki and Ari Aharon's house, I broke the news to Ken (my husband and an internal medicine and kidney specialist) that I wanted to climb Kili with Larry. Rami and Michal Grinwald were also there and heard the news and Rami said he wanted to go too. Ken told me that an associate of his, Fred Yorra (a pulmonary specialist,) recently returned from a Mt. Everest Base Camp expedition and was willing to share his experiences and talk about the possibility of going to Kili with me and Larry. Larry asked Deanna Nelson of Bennett Travel to organize an Abercrombie & Kent Kili expedition briefing and slide show at his house. She did a great job and even brought in special guest Lynn Leakey. Of the 20 or so people who came that night, only Larry, me, and Andy Katz (another Mt. Whitney alumnus) continued to be interested. Bobby Katz (Andy's brother) couldn't comprehend why we would even consider the trip. We tentatively reserved space on an A&E August 2001 trip. Larry, Helene, Brad Ramberg (yet another Mt. Whitney alumnus) and I took a field trip to see a 9:40 p.m. showing of "Vertical Limit" at the Century City AMC Theatres. There were a lot of bad outcomes in the movie and we questioned our sanity. "First of all I would consider taking only Diamox 125 mg B.I.D. [twice a day] and carrying the Decadron in your backpack and taking it only if there was progression of AMS [acute mountain sickness] and you could not descend. No point in taking Decadron in addition to the Diamox. If you read the BMJ [British Medical Journal] article about taking 750 mg of Diamox, disregard it. Drink about 3 quarts of water per day. Do not exert yourself. Carry a light pack. Eat a high carb diet and have a good time. That should do it." "I went on a wilderness travel trip to Chile and it was fabulous and on my trip were 5 different people that hiked Kilimanjaro. Based on their discussions I have decided that I don't think Kili is the best trip for me. However, some made it, some did not, and they gave specific reasons why. Said it was very cold, said the ascent of 4 days was almost impossible to do and make it and that those that did that trip, most got sick, vomited and some had to be carried down on stretchers. Some said they did not think the views were that pretty and most of the time you could not see the mountain because of fog. This sounds like no fun." Hmmm. Maybe we should reconsider? Helene arranged for Andy, Larry and I to have dinner with Professor Bill Creasy who had made a summit bid on Kili, but didn't make it because of a previous knee injury. We ate at a restaurant in Santa Monica called Typhoon and I got food poisoning. The next day, I thought I was going to die. Ken brought Compozine and Tylenol suppositories and two bags of I.V. fluids from the hospital for me. As he was stabbing me with the I.V. needle, he said, "What are you going to do on that mountain if you get sick like this up there?" Fred told Ken that Karen Feenberg, a nurse at Tarzana hospital, summitted Kili with her daughter in 1998. Ken spoke with her and then said I should speak with her as well. I called her immediately and she encouraged me to take the trip. "I started taking Diamox the day before my summit; however, the correct course of therapy would have been to start three days before. I plan to do this the next time I try to go over 17,000' and I'm sure it will make a difference." Larry, Helene, Andy, Fred, Karen and I met at Larry's house to get acquainted and to hear about Karen's experiences. Karen was enthusiastic about the trip and highly recommended it. Fred said that he would go if we would change outfitters from Abercrombie & Kent to Mountain Madness (because Mountain Madness always takes along a portable oxygen chamber.) Ken said I could only go on the trip if Fred went, and Helene wasn't going to go unless I went, so we changed outfitters. Ascent marked with white dashes and descent marked with red dashes. "Temperatures vary considerably with height and time of day. On the plains surrounding Kilimanjaro the average temperature is about 30 degrees C. At 3000 meters, frosts can be encountered at night while daytime temperatures range from 5 to 15 degrees C. Night time temperatures on the summit can be well below freezing." Larry emailed us and confirmed that we are good to go in August with Mountain Madness. Fred emailed, "I am ready to sign up for the August 20th trip whenever you all decide." Andy emailed, "Ink me in, too. I think this will be a blast (remind me of this while I'm puking at the top.)" "The training I did for Nepal was basically as much aerobic working out at the gym as I could do. In the last three months before going, I was trying to go to the gym about 3-4 times a week for about 40-45 minutes of aerobic workout. I have been using the stair climber, which I find less boring than the bicycle. I have never been much of a runner or tread miller but then again my knees and back have so far not failed me even at my advanced age. I would also do 10 minutes or so of upper body weights on the weight machine. In addition to the above, I tried to hike twice a week, if possible, on my afternoon off and a weekend day when not on call. In the last few months before the trip, I carried a pack with perhaps 10-15 pounds and tried to do as much vertical as possible aiming for 2500-3000 feet at least on the weekend hike. Right now the Santa Monicas are great but as summer approached I tended to get out to the San Gabriels at higher elevations where it was cooler. This was as much training as simply enjoying the hiking. There are some great hikes in the San Gabriels and, perhaps, as our trip approaches, we can organize some day hikes to Baldy, Baden-Powell, Mt. Wilson, Strawberry Peak, San Jacinto, etc, etc, etc." Andy emailed us the shocking news that about one third of Kilimanjaro's ice field has disappeared in just 12 years, and 82 percent of it has vanished since it was first mapped in 1912. We breathed a collective sigh of relief that we were not going to miss seeing The Snows of Kilimanjaro. I read Hemingway's The Snows of Kilimanjaro. I was disappointed to learn that Rami Grinwald was not available to come with us on the trip because he was going to accompany his son to U.C. Berkeley at that time. I tried to recruit Deb Klein (of Kashmir/Ladakh fame) to join us, but she decided to pass. I watched the movie "K2" again. Larry and I met with our friend Joe DiNunzio and he shared his experience climbing Kili via the Londorossi route, the same route that we planned to take. Andy recruited Peter Rosendorff to join us. Andy wrote, "Peter is an Econ Professor at USC. He is from S. Africa and a lot of fun." Larry emailed us this link regarding getting fit to climb Kilimanjaro. http://www.tribesafari.com/fitness.htm. I thought the program was a tad ambitious. Some friends of Larry's and mine, Hans Dreyer and Jeff Grass, (a.k.a., 'the Traveling Idiots") published their account of their Kili climb. I sent in my paperwork for a Tanzanian visa. I made my final payment for the trip. I tried to recruit Suzanne Schweitzer to join us, but she decided to pass. I watched the movie 'the Snows of Kilimanjaro" starring Gregory Peck. Larry, Andy, Helene, Peter, Fred, Karen and I met for lunch at Sisley restaurant in Sherman Oaks to review the medication and equipment lists. We also finalized our hiking training program. Fred informed us about a recent double blind, placebo-controlled study where 40 volunteers who lived at 1400m (4,597 ft) were taken rapidly to 4300m (14,110 ft) and spent the night. Compared to those taking placebo, subjects taking Ginkgo Biloba had half the incidence of AMS symptoms, and those on Ginkgo Biloba who did become ill had far milder symptoms. Ken said he would not permit me to take Ginkgo Biloba because it is not FDA approved and there have been incidents in the past where non-FDA approved herbal/dietary supplements have caused death due to toxic substances in the filler or the capsule. He also pointed out the disclaimer on the Ginkgo Biloba bottle that said that this dietary supplement is not proven to cure anything at all. Anything. At. All. We fervently began following our physical training program. Bobby Katz and Carol Golden sometimes joined us at the 4th Street Santa Monica stairs. Suzanne Schweitzer, Jerry Hamburger, Karen Feenberg, Trish and others joined us on some of the conditioning hikes. Shari Mitchell and I pounded the Tarzana trails despite the horrendous San Fernando Valley heat. Shari was training for the upcoming Santa Barbara to Malibu Avon Three Day Walk. Katy Knudsen at Ho Rehab Center helped me build my core strength. Some of the hikes were so wonderful that we felt that we would have been fulfilled even if we were not able to make the Kili trip after all. My favorite was the class three bouldering hike at Strawberry Peak. My second favorite was Mt. Wilson because I'd always wanted to climb that. My least favorite was the one in Antelope Valley where the trail was infested with gnats. I was so glad I had my silly Solumbra sun hat/mask to cover my nose and mouth. But I did end up swallowing a bug anyway. Yuck. I consulted Russ Klein (an infectious disease specialist) on what vaccinations and inoculations I needed for the trip. He gave me Hepatitis A, Yellow fever, Typhoid, Tetanus, Polio and a prescription for Larium, an anti-malarial medication. That Larium was some good stuff! My dreams were so vivid and wild! The New England Journal of Medicine published an article on "High-Altitude Illness" which consequently became our bible. http://www.nejm.com. Linda (Larry's wife) hosted a 40th birthday party for Larry and made centerpieces of hiking boots filled with flowers. Bill (the oldest of my two older brothers) and Marcia announced their engagement to be married. Ken dubbed us the "Mountain Meshugunas." He was less than thrilled that we were actually going through with this wild adventure. I had my hair braided in cornrows to make it easier to care for in Africa. It took two and a half hours to braid and it hurt a lot. Larry, Helene and I went on a shopping spree at REI in Manhattan Beach. We spent so much money that they offered us ownership in the company. We depleted their entire inventory of expedition weight socks. I consulted Earl Gordon (an internal medicine and nephrology specialist) on my health in general and the high-altitude medications in particular. The best news was that Earl was going to let me increase my Synthroid dose for my hypothyroidism, which would mean that in the near future, I would be more awake and less cold. Ken took me on a shopping spree in the pharmacy in his office and then typed up the purpose of each medication and their proper dosages. He also printed for me information from Up-To-Date, a medical database, on high altitude medicine. Larry, Peter, Helene and I met at Larry's with all of our gear to exchange ideas and share best practices. I unloaded my pharmacological collection on Larry's T.V. room coffee table and everyone laughed at how many drugs I was bringing along. Of course I had the last laugh. We reached our goal of working up to 18 sets of 4th Street Santa Monica stairs. We have fond memories of the "cat lady" who lives next to the stairs and the odors we endured while training there. Helene and I had lunch with Olga Popel (a rheumatology specialist) because we had heard that she had recently returned from summiting Kili via the Umbwe route. She said that everyone on her trip summitted. She gave us a book that she read when she was preparing to climb and she fueled our excitement for the trip. Somehow we got on the subject of the cornrows in our hair and the pros and cons of various types of sunscreens and though Olga wanted to share her climbing experience, we said, "Enough with the climbing information, how did your hair and skin hold up?" She said that her skin didn't do that well because of the layers of sunscreen and all the dirt. That's when Helene and I vowed to have the best-looking skin on the mountain. She told us about a coffee-table type book by Jon Reader called Kilimanjaro that was out of print in the United States, but available in Tanzania and she asked us to bring one back for her if we saw one. I prepared goodie bags with books, DVDs, art materials and toys for Jordan, Elana and Brandon for each day that I would be gone. I recorded my kids' favorite songs and stories on cassette tapes so they could hear my voice while I was away. I even recorded a tape for Ken. Ken and the kids chose photographs for me to take with me. Elana loaned me her Disney princess locket to wear. Larry developed a hot-line/call-in system for his satellite telephone and home answering machine. I loaded up Ken's MP3 player with music from Juse Woythaler's collection to take with me so I could listen while trekking. Linda hosted a Shabbat dinner for all of us going on the expedition and our loved ones. As we discussed the sub-zero weather that we expected to have to endure, Linda said, "I'm SO sorry that I'm not going to be joining you for this trip." Fred suggested that I bring a hot water bottle along to keep in my sleeping bag for warmth.